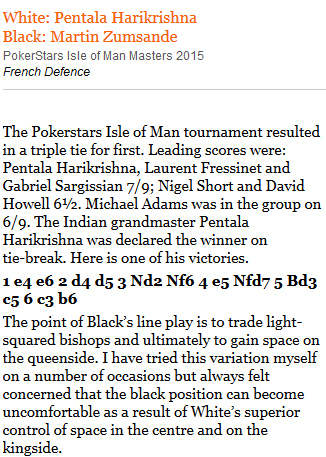 The Streatham & Brixton Chess Blog: Whatever happened to the French Defence? and it was certainly the last time he rolled it out (a decision he perhaps regretted after the debacle of the final game). But he didn't play it in 1981 either, much to the surprise to those of us who grew up watching him hold Karpov to draw after draw. Perhaps it would all have been different if Korchnoi had squeezed out one more draw in 1978 and gone on to win the match. World champions set fashions and Karpov never had a lot of time for the French: he did play it three times as world champion, but two of those were short and possibly pre-arranged draws, while the other was a disaster which (if Cafferty and Taimanov are to be believed) may have owed a lot to an assumption on Karpov's part that he was not engaged in a serious contest. 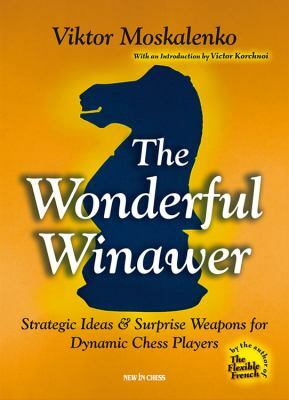 Karpov described this as the first French of his career (which is correct, if you discount transpositions and games played before his teens) which is not only one more than his predecessor could be bothered with, but one more than his great successor managed, if we exclude blitz games, non-human opponents and transpositions. Disdain for the French Defence (did Kasparov say "3. Nd2 is good enough to win, but 3. Nc3 is better"?) monopolised the world title from 1972 to 2000. Botvinnik was a master of the opening, Petrosian was fond of it and even Spassky, not its greatest admirer, employed it to win a Candidates match on the way to the title. But no enthusiast for the French (and it's more than a stretch to call Spassky that) has held the title since. Kramnik stopped playing the French before he won the title. So did Anand, one rapid game aside, provided it's the canonical title we're talking about - he had a few goes while the holder of the FIDE crown - and Carlsen has just the one rapid game with it since he's been the champion. Nor did Nigel Short play it against Kasparov (or in the Candidates series preceding that match, albeit only Timman of his opponents was a 1.e4 player). True, Radjabov beat Kasparov with the French in 2003, not a defeat the loser took particularly well, and Morozevich was still beating good players with it a few years later. though we're still waiting for a good book that's purely about the MacCutcheon. The French remains a perfectly playable opening for the likes of me - and for rather better players than me as well. But still, it's striking. More than striking. Since that game in 1978 - and the ten games after it in the same match - we've seen sixteen world championship matches. Korchnoi played Karpov again. Karpov played Kasparov five times, then Short, Anand and Kramnik once apiece. Kramnik played Leko, Topalov and Anand. Anand played Topalov, Gelfand and then Carlsen twice. Sixteen matches and a bit - by my count, three hundred and eight games at normal time limits and eight at faster rates. Of those three hundred and sixteen games, not one has been a French. How come? Whatever happened to the French Defence? Was Agdestein in Norway Chess 2014 the last time we even had the French in a super-tournament? Feels that way. 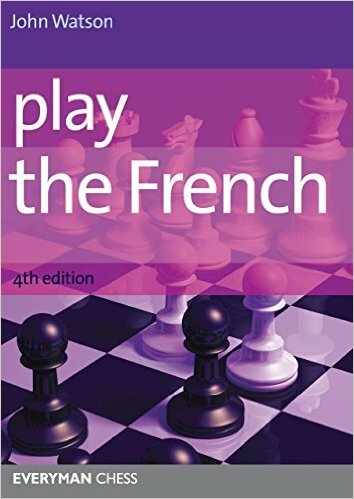 Also, it's not a whole book but "Playing the French" by Aagaard and Ntirlis has 3 good chapters (60-odd pages) on the MacCutcheon from the Black perspective. Yes, there's also a decent chunk in the Watson book displayed in the post. Talking of display, the game viewer doesn't appear to be working today, not in this post nor in previous posts that employ it, which is lots of them. I've contacted support to ask them if the problem is temporary. If it's not then there's going to be a lot of mangled posts in the archive. As observed, the elite appear to have little confidence in the French. It's difficult to find out why, as they don't play it amongst themselves and they relatively rarely face the non-elite who might give it a try. When Carlsen faced it in 2014 against Rodriguez Riga, he appeared to treat it with disdain. Possibly those who might try it as Black regard all the main lines as being in White's favour. Nigel Short was someone with a long history of playing the French, who declined to use it in 1993 against GK, preferring to defend the anti-Marshall and the Scotch instead. The viewer looks fine to me at the moment. I suspect the issue is either Flash is not working in your browser, or, if it "fixed itself" that could have been caused by a temporary internet or site outage. But let me know if it continues or happens again. Glenn - thanks. Having asked around, it seems it works in some browsers - and some versions of those browsers - but not others! This particular laptop did a strange thing on Monday whereby it spent half an hour telling me it was installing Windows 10, despite the fact that Windows 10 was already installed. Nothing else seems to be wrong, but naturally I'm wondering whether that might have made the difference. Another book with a lot of MacCutcheon coverage is Antic and Maksimovic's The Modern French (New In Chess, 2012) although as with a lot of that publisher's books I find the layout hard to follow. I think the French is a fine opening. I have a good record with it as black. The only problem is my record after 1...e5 is even better.